Mizutaki is a type of Japanese hot pot called nabe. It is made by simmering vegetables and chicken. The recipe of the mizutaki served at Toriyasa has been handed down from generation to generation. Toriyasa is located a 5-minute walk from Hankyu Kawaramachi Station, in the entertainment district of Kyoto. The restaurant has been in business for over 200 years, and it’s said to have been frequented by the famous Sakamoto Ryoma. Their famous mizutaki uses a chicken broth that is cooked for three days. The richness and the flavor are beyond words. There is something nostalgic about the hot pot simmering away in front of you; to think that people have kept coming to this restaurant for 200 years just to taste this nabe! They also have many other a la carte chicken dishes, so those who like chicken: rejoice! The building the restaurant is in is in great shape, and has even been registered as an important cultural property of Japan. At Toriyasa, you definitely want to order the course meal that includes Mizutaki nabe. The Mizutaki contains choice chicken, Chinese cabbage, shiitake mushrooms, edible chrysanthemum, tofu, yuba (tofu skin), and mochi rice cake. The chicken has just the right amount of firmness, letting you experience the chicken’s deliciousness with each bite. It is very creamy, but the aftertaste is lighter and cleaner than you would think. The staff will prepare it for you at your table, so there is no need to worry about how to eat it. It also comes with hors d’oeuvres, chicken liver, rice porridge, pickled vegetables, and a dessert. *Note that a service charge of 20% is not included in the price. Not only does it have a savory batter coating on the outside, the chicken is tender and juicy on the inside. You can tell that they use high-quality chicken. It lets you enjoy a different flavor from the chicken in the Mizutaki . Squeezing on a little lemon juice adds a crisp and refreshing taste. It also makes a perfect match with Japanese beer. This lets you enjoy the great taste of chicken in a unique way. Chicken skin is flattened and fried to a savory crisp. The crunchy texture is a lot of fun. Adding a little spiciness with red pepper helps bring out the flavor of the chicken. This dish is made with stewed fresh chicken livers. The sweet and spicy sauce is well-balanced against the slight bitterness of the liver. Chicken or beef liver typically has a slimy texture, with a rich and distinctive taste, but Toriyasa’s chicken livers have a light and simple flavor that makes it easy to eat. It goes very well with sake. The restaurant’s own special containers in which the chicken livers are served are also quite charming. *You must call in advance to make reservations if you want to order it. There are English menus available. You will definitely want to order the Mizutaki, and the details are listed on the menu under course meals. If you want to enjoy a variety of chicken dishes, then you should also order some of the a-la-carte dishes. If you order Mizutaki, you can enjoy a soup flavored with quail eggs, salt, and red pepper. There is enough to have four or five extra servings, and it is so delicious you will be left wanting more. That said, if you drink too much, you may end up getting full, so I recommend limiting yourself to just three bowls. Toriyasa is housed in an old-fashioned Japanese-style wooden building. You will definitely be charmed by the atmosphere when you step inside. Be sure to get a good look at the traditional Japanese-style interior design and decoration as well. Mizutaki is my recommendation here. First off, drink the soup, which is flavored with quail eggs and salt, and admire that flavor! You won’t be able to get enough, but I recommend limiting yourself to just three bowls. Otherwise, you end up getting full on the soup alone. After that, enjoy the chicken, vegetables, and other ingredients. 5-minute walk from Hankyu Kawaramachi Stn. 5-minute walk from Keihan Line Gionshijo Stn. 11:30 - 10pm (L.O.8:30pm) *Be sure to arrive at the restaurant by 3pm if you want to order from the lunch menu. ・A course meal must be ordered. ・There is a 20% service charge with an order of Mizutaki. 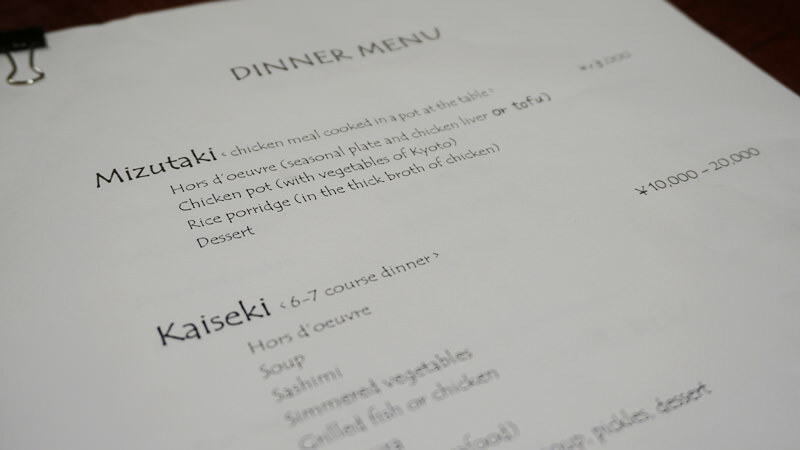 ・There is a 20% service charge with an order of Kaiseki. There are English menus available. English-speaking staff members are sometimes present. Even the staff who cannot speak English should be able to answer questions about the menu or how to eat different dishes through gestures. Staff able to provide service in English may not be present at all times. Non smoking *There are smoking areas in the front entryway and inner garden.